Hey a (kinda) timely post for once! 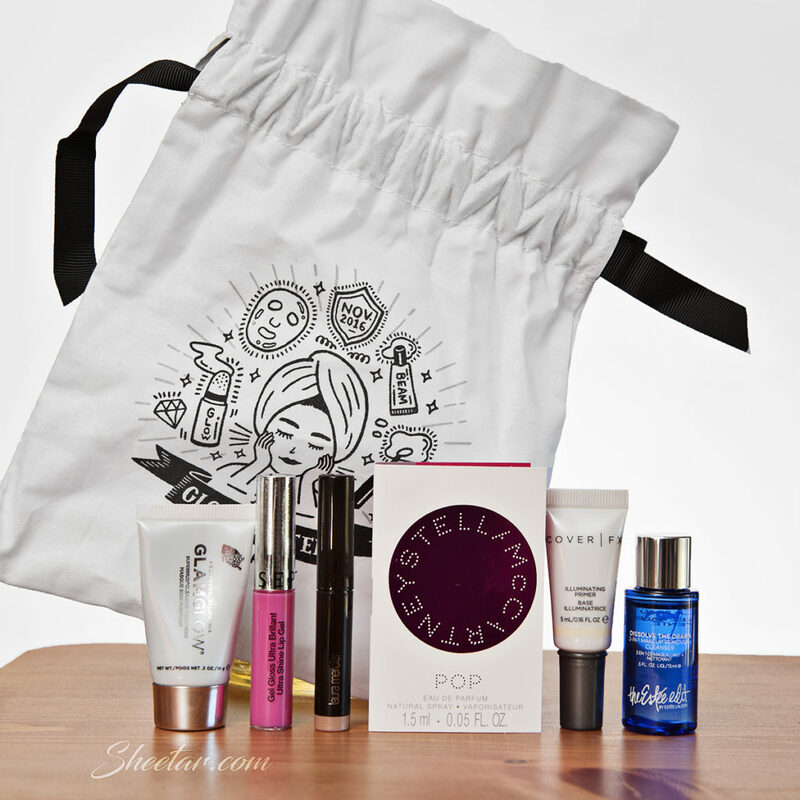 This edition of Sephora Play! came in a few weeks ago with a theme, “Beauty, Set, Go,” which they say is a selection of, “super effective, ultra-hydrating skin care, makeup, and hair care to detox and refuel your beauty routine.” Ehh, I’d say it’s a big miss on the theme here outside of maybe two items. If you’re looking to “detox” (which IMHO is one of those goofy buzzwords – you detox every time you breathe or sweat, products can’t do it for you), why would you use products that are tested on animals or hair products that contain loads of chemicals instead of natural ingredients? I had hoped for a more cruelty free and vegan/natural set of products, but no such luck. The bag this time is white nylon with mesh on the back and reads, “Sweat is Just Another Way to Glow.” Cute! I like that they’re switching up the bags now. AmorePacific Color Control Cushion Compact – 1.05 oz / $60 – (Product is .1 oz, value of $5.71 by volume) I don’t use foundation a whole lot, but I have tried this product before. It’s.. okay. Neither color really works well on my skin, and I have no need for SPF 50 in my foundation since I tend to only use foundation in the evenings for special occasions and not as an everyday thing. It bothers me A LOT that a chemical blocker is added to most foundations and creams anymore since I’d rather it be a choice than a mandate. I don’t need SPF at night! The sample size here is also a matter of a gripe – once the pouch is opened, there’s no way to give it a quick test and then use it later since it doesn’t re-seal. Ouai Treatment Masque – 2.4 oz / $32 – (Product is .5 oz, value of $6.67 by volume) Another super heavily perfumed product from OUAI that I can’t use on my hair since I don’t use silicones on my hair. There are some really quality ingredients in there, but they’re ruined by the silicones and a really curious ingredient, “Chlorphenesin,” which Wikipedia lists as a muscle relaxant that can cause allergic contact sensitivity. Not putting that anywhere near my dry scalp, no thanks. It does beg the question though, is Ouai the new Harvey Prince of Sephora boxes? There have been two products from this company that I haven’t been able to use on my hair and found to be overly perfumed. Not a fan, Sephora, not a fan. Clinique Almost Lipstick – .07 oz / $17 – (Product is .04 oz, value of $9.71) It’s supposed to be a universally flattering color and does go on rather sheer so that you can build a deeper color if you want. I found it to be way too dark for my tastes (I prefer berry and red colors) and it tipped a little too far into an icky black/brown on my lips, even with just one swipe. The formula is nice though, moisturizing yet still light, I’m just not into the color. Tarte FRXXXTION Stick Exfoliating Cleanser – 1 oz / $22 – (Product is .22 oz, value of $4.84 by volume) This is a neat way to apply an exfoliating cleanser! I like the idea that it’s in a tube as a solid gel, but you still have to work it into your skin with your fingers, so it’s not like it keeps your hands from getting messy. The exfoliation is like a very fine dust instead of a coarse sugar scrub, so it’s gentle, but not too gentle. You can still feel the grit working away at your skin as you work it around your skin. I’m not sure I’d buy it since I prefer scrubs that are more coarse (dry skin, so it needs a heavy exfoliation), but it’s a neat idea, and I’m glad I got to try this! Farmacy Honey Potion – 4.1 oz / $56 – (Product is .32 oz, value of $4.37 by volume) I have to admit that this is the product I’m most interested in out of the box. I’m a beekeeper, so a honey potion mask? YES PLEASE. The ingredient list shows they use a whole bunch of bee products from Honey to Propolis and even Royal Jelly in addition to herbs and vitamins. I haven’t yet tried this, but I use honey as the carrier for powdered clay masks all the time, so I know this is going to be right up my alley. Tory Burch Love Relentlessly – 1.7 oz / $86 – (Product is .05 oz, value of $2.53 by volume) It’s.. okay. It’s not something I’d buy for myself, but it’s not a mess of florals, so I’ll at least end up using this sample. It comes out just a little bit too cotton candy sweet for my liking – I’d have preferred the sandalwood to deepen it and make it a little richer, but it’s just not happening for me. Overall the value of the box comes out to $33.83 which is a great value when you consider it only costs me $10.60 including tax per month. I guess this one was a bit of a disappointment this time around since the hair masque and lipstick are huge misses for me and the two items I do like, the Tarte exfoliator and Farmacy mask just barely squeak out to cover the cost. I know, I’m more of a cruelty free makeup maven, so this isn’t quite a good fit, but for only $10 a month, I really enjoy getting the samples, even if they’re sometimes misses. I still get to try things I wouldn’t normally try, so that’s a win for me! December’s Sephora Play! arrived before the holidays, but you know how crazy things get with travel and such, so this is just going up on the blog now. The theme was, “The Partygoers,” and featured items that were must haves for the party season. I was expecting a little more glitz and glam, maybe a glittery eye shadow or something like that, so this one didn’t really live up to my expectations. The black bag with gold lettering was a nice change of pace though! Bobbi Brown Smokey Eye Mascara – .2 oz / $30 – (Product is .1 oz, value of $15 by volume) So, it’s black mascara. Really basic, not so much party themed. I’m.. just not excited. I would’ve liked something different like a glitter eyeliner or I don’t know, something else. We did just get a black mascara in the August box as well, so.. meh? I feel like I have SO much black mascara at this point, unless it’s some new brand that’s cruelty free, I really am just neutral on this. I’ll use it, but.. eh. Make Up For Ever Step 1 Smoothing Primer – 1 oz / $37 – (Product is .16 oz, value of $5.92 by volume) This is in the Natural finish, “Base Lissante,” and is basically a lightly tinted silicone based primer. Again, nothing really earth shattering here, it goes on matte, but I didn’t feel like it did anything spectacular or fill in lines or improve texture like it says it’s supposed to. Sephora Cream Lip Stain – 5 mL / $14 – (Product is 1.3 mL, value of $3.64 by volume) I received the color, “01 Always Red,” which is labelled as a matte bold classic red. It’s definitely as advertised! The red is stunningly perfect and goes on like a matte lip cream and stays put. So far, I’m pretty impressed with this and love that it’s matte without feeling too drying. Urban Decay All Nighter Makeup Setting Spray – 4 oz / $31 – (Product is .5 oz, value of $3.88 by volume) This is a product I already know and love and actually fits the theme pretty well since it keeps your makeup right where you put it, easily keeping your makeup perfect all night. It’s nice to have this as a sample size to tote along with me! Drybar Bay Breeze Hydrating Shot – 4 x .5 oz – $38 – (Product is .5 oz, value of $9.50) This is a nope for my curly hair. It contains silicones – in fact, the 3rd ingredient is a silicone – so for a low to no shampoo regimen, this is a nope. This specific silicone, amodimethicone, builds up on hair and won’t wash out without using a harsh sulfated shampoo that I won’t use, so this is going to the trade/share pile. Elizabeth James Nirvana Bourbon – 1.7 oz / $85 – (Product is .07 oz, value of $3.50) I’ve gotten a couple of samples of this, but I do really like it. It’s a warm, woody scent that’s right up my alley with a blend of vanilla bourbon, oakwood and a nearly unnoticeable hint of tuberose. It’s not overwhelming or too sticky sweet, but it makes for a nice twist on plain old vanilla that’s got a great warmth and richness to it. The total value comes to $41.44 for a box that only cost me $10.60 including tax. I’m super disappointed with the hair product, but I generally will be disappointed with hair products since I’m so picky about what I put in my hair. The winner out of the box for me was the cream lip stain with the setting spray a close second, but the two together really don’t quite cover the cost of the box. This one just kind of fell flat for me – I really did expect more glitz and glam for a party themed box. Oh well, looking forward to the next one! Oh man am I behind, like, crazy behind. Yes, this November edition of Sephora Play! arrived on time as usual, but it’s been sitting around until I had time to sit down and actually review it. Things get pretty crazy this time of year and with all the other commitments, the first thing to go is keeping up with the blog. But hey! Better late than never, right? The Estee Edit Dissolve The Drama – 6.7 oz / $32 – (Product is .5 oz, value of $2.39 by volume) I’m a total ingredient-reader, but the only way I could find a printed list of ingredients for this product was in the Sephora Q&A section – Estee Lauder doesn’t even have a list on their website! Anyway, the first oil is 9th out of 17 on the ingredient list, the first 7 being chemically derived thickening agents. Really unimpressive. The whole Estee Edit line is really unappealing to me since it feels like it’s trying too hard to be something young and hip but still using the same tired old ingredients and formulas in a new package. This has a very light fragrance that I don’t find appealing (stinky floral) and the texture is odd – like rubbing alcohol and oil at the same time. I won’t even dare bring this near my eyes to try it since they’re too sensitive and I love my plain jojoba oil for makeup removal MUCH better. Cover FX Illuminating Primer – 1 oz / $38 – (Product is .16 oz, value of $6.08 by volume) This is WAY too light for my skin. I didn’t find that it illuminated so much as visibly lightened and I’m already a pretty fair shade of pale to begin with. I probably couldn’t use this all over my face, just in areas where I needed a highlighting boost. Honestly, I prefer a more matte look and this definitely leaves behind a dewy sort of look that I don’t like. Laura Mercier Caviar Stick Eye Color – 1.64 g / $29 – (Product is 1 g, value of $17.68 by volume) The color I received is, “Rose Gold,” which is pretty much just plain gold (not like Apple’s new name for pink). I’m not a huge fan of cream/stick eyeshadows like this since they tend to crease, but I haven’t had a chance to try it out just yet, so the verdict is out so far! The color goes on nice and blends easily though so I’ll still use it, I’m just not huge on the formula. Sephora Ultra Shine Lip Gel – .11 oz / $12 – (Product is .1 oz, value of $10.90 by volume) The color I received is, “Pin-Up Pink,” a pretty bright, almost neon pink. There’s really barely any color payoff, so the color isn’t nearly as intense on as it looks in the tube. For a gloss, it’s not that sticky and actually feels nicely moisturizing. There’s a light bubblegum scent/flavor to it that’s actually surprisingly nice! GlamGlow Supermud Clearing Treatment – 1.2 oz / $69 – (Product is .3 oz, value of $17.25 by volume) My first thought was, DAMN, that’s pretty expensive for what’s basically a mud mask. The ingredient list has a decent concentration of an ingredient that contains AHA and BHA which my skin responds pretty well to, plus the usual clay and charcoal. Unfortunately, it has a very heavy peppermint scent to it as well as including peppermint oil, so that’s a total deal breaker for me. I did try it out since I had the sample. The formula is a medium to thin consistency and a dark grey from the charcoal with little bits/chunks of what are apparently tea leaves in the formula. You’re supposed to use it very thinly which may allow for about 3 applications in the sample tube. The peppermint makes it feel cooling, but it also caused my eyes to water since the scent is rather strong and after a little while my skin felt like it was burning too (I seem to be a little sensitive to peppermint oil). Did it work wonders on my skin? Ehh. Not $69 for just over an ounce of product miracles, but my skin did feel toned without feeling tight, so it was nice, but not quite worth the price tag. Between the peppermint and the price, this was fun to try, but I’d never buy it. Stella McCartney Pop Eau de Parfum – 1.6 oz / $72 – (Product is .05 oz, value of $2.25) The musk doesn’t balance out the awful florals enough to make this wearable for me, so this is another in a long line of floral fails for me. It’s not as terrible as some of the other samples, but it’s definitely not one I could wear and not want to wash off in under 10 minutes. I still prefer the cedarwood, sandalwood, and musks by themselves without any of the violet or plumeria. For a value, this box totals up to $56.55 which is a great value when you consider I only paid $10.60 for the box including tax! This box was less of a hit than others since I really didn’t like half of the box, but the half I did like was where the big values were with the eye color and mud mask. I mean, even if I didn’t necessarily like the mask, I’m glad I had a chance to try it, especially since it has such a high price tag for the full size. And hey, the box is all about trying new things, so that works! Looking forward to December’s box! October’s Sephora PLAY! theme was, “The Cool Cut,” and was hinted to feature indie brands and new, stand-out products. Well, I definitely got a bit of that, though some brands are very mainstream and not new at all, neither are the products, so again the theme is sort of nebulous and some things fit, some don’t. This month also featured the most number of variations I think we’ve seen for this box yet, so it’s more likely that the samples picked are going to fit your beauty profile. It’s still fun to get these samples, so, on to the contents! For the record, my box was the variant with item # 1850106. Farmacy Skin Dew – 3.3 oz / $44 – (Product is .68 oz, value of $9.07 by volume) I’m not sure I’d use this on top of makeup as it says it can be used since it seems like spraying a glycerin based product over makeup would be a recipe for disaster. I did give this a quick try and I don’t like the scent at all. Mint is meant for toothpaste, not something you spray on your face and it just.. ugh. It also feels sticky even after giving it a few minutes to dry or sink in, so I can’t say I like this from the scent to the formula. I have been wanting to try a Farmacy product for a while though, so this was great to try, and good to know that this definitely isn’t for me. The brand is cruelty free though, so I love that! The Estee Edit Flash Photo Gloss – .27 oz / $20 – (Product is .1 oz, value of $7.41 by volume) The color is, “01 White Flash,” and is a pearlescent colorless cool-toned gloss. It’s rather sticky and thick for a gloss, and doesn’t pass the hair-stick test (my hair totally stuck to my lips in the gloss when I shook my head around). There’s no discernible color payoff, so the pearlescence doesn’t even show up, nor is there any discernible scent/flavor (it’s supposed to be vanilla fragranced). Estee Lauder isn’t an indie brand and this isn’t a new, stand-out product, so this feels weird to be in the box for this theme. Naked Elephant T.L.C Framboos Glycolic Night Serum – 30 mL / $90 – (Product is 5 mL, value of $15 by volume) Another cruelty-free brand I’ve been wanting to try. This sounds like a good choice for my skin profile as it claims to be a solution for dullness, blemishes, and dark spots. It can be used all over the face or as a spot treatment, and one drop was plenty to cover my whole face. There’s no real scent to the product that dispenses as a clear gel. The 5 mL sample size should be enough to see if it makes a difference or not since 5 mL should go a fairly long way. The product is pricey, but at a 30 mL size, that should last an average person months and months. Derek Lam 10 Crosby Silent St. – 1.7 oz / $95 – (Product is .05 oz, value of $2.79 by volume) I think this might be the first perfume sample I’ve liked! The base is white musk so it’s a musk, but lighter, with the faintest soapy, sweet floral notes. It’s ok! Nothing I’d go out and buy, but this is a sample I’ll actually keep and use. Smashbox Always On Matte Liquid Lipstick – .13 oz / $24 – (Product is .07 oz approx, value of $12.92 by volume) The color I received is, “Driver’s Seat,” which is described as a warm pink. I’ll admit that I was skeptical of the color at first since it seemed a little yellow-toned and anything that tips over to yellow or a coral type shade just doesn’t work with my skin tone. On first application I thought well, maybe this is just a somewhat darker neutral, and it’s not so bad. But I’m torn – this trends over to look a little orangey on me and.. I’m not sure. I think “Shockaholic” is a shade better suited to my skin tone. It may take a few extra wears to sell me on the color. The formula goes on rich and creamy and dries very matte and does. not. budge. I’m impressed with the product and the formula, but not as much with the color, but it may grow on me. Madam C.J. Walker Scent & Shine Coconut Oil – 1.7 oz / $26 – (Product is .15 oz, value of $2.29 by volume) This is RIGHT up my curly hair alley. The ingredients are coconut oil and fragrance, so it seems like a lot to pay for what is essentially perfumed coconut oil, so I’m not sure I’d buy this on my own. The scent is delightful – coconut and vanilla with a bit of woodsy musk. Since my curls are always parched, I tried this right away. Five drops were enough to give my ends a good coating and left a little behind to smooth into my hands as a little bonus treatment. The scent is really delightful, and if it wasn’t just scented coconut oil, I may be interested in buying this again, but since it’s just coconut oil, and I can get that pretty cheap at the grocery store, I have a hard time justifying the price for just the fragrance (but I do REALLY REALLY like it). I love that I got to try this though, and it’s absolutely perfect for my profile. So, all together, the value of the box is $49.48 which is great for the monthly cost of $10.60 including tax and shipping. I think the product I like the most is the Madam C.J. Walker Scent & Shine Coconut Oil since it’s just the perfect fit for me. My least favorite is the Estee Edit Flash Photo Gloss since it’s just way too thick and sticky, even for a gloss. Overall though, I got to try a bunch of products I’ve been eyeing up for quite a while, so that’s great, even if some of them didn’t wow me as much as I had hoped. Having a trial size to test out before going all-in on the full size is fantastic, and not having to go fight through the mall and parking to get to a Sephora store and ask for a sample is even better. The theme for November is, “Best in Glow,” so I’m looking forward to what they pick for my profile for next month!